Google Web Toolkit (GWT) is a popular framework for building Java-based AJAX applications. GWT was realeased in May 2006 and I’ve personally used GWT since 2009 with much success. However, there has been some concern over GWT’s future. In Oct 2011, Google announced the Dart language and toolset. At first blush, Dart is very similar to GWT. It allows a developer to create AJAX based web apps using an OO programming language. The main difference between GWT and Dart is that Dart has it’s own OO programming, whereas GWT makes use of the Java programming language. Other than that, there is a lot of overlap in functionality between the technologies. This overlap makes you wonder if Dart is a replacement for GWT. According to the folks at Google, GWT is still available and will be maintained but the new focus is on Dart. The future of GWT does not depend on Google’s support since there is already a thriving GWT community. A GWT steering committee has been formed that is composed of key community participants. The GWT steering committee recently published a report: Future of GWT 2012. The report is based on a survey of 1300 GWT developers worldwide. In this post, we will learn how to validate SmartGWT forms. We will develop the following form. The SmartGWT API provides a collection of validators in the package in the package com.smartgwt.client.widgets.form.validator. In the code, we create an instance of the DynamicForm class. Then we set the orientation style for our error messages. We have the option of placing the error messages to the left or right of each form field. You can simple specify FormErrorOrientation.LEFT or .RIGHT. Alternatively, we can display the error above or below the field using FormErrorOrientation.TOP or .BOTTOM. Now we can build each one of the fields and add them to the form. Here’s the code for creating the first name, last name and email. They are all text items. We construct the text items by calling the constructor and passing the form field name and title. The form field name is the traditional HTML element name and the title is the text displayed on the page. As mentioned, we create each text item by passing in the element name and title. We also set title wrap to false, this will make sure the title text is displayed on one-line. For simple validation, we specify the field is required. This code generates the following UI. Now, we’ll construct the fields for the passwords using the PasswordItem. The PasswordItem component will allow the user to enter a password however, the text will not be visible. This works like a traditional password field. We’ll have two fields for the password for the user to confirm the password entered. We’ll add a validation rule for making sure they match later. For now, we’re just focusing on building out the form fields. We will add a button to the UI for the user to click. The button is labeled “Register”. When the user clicks the “Register” button then the form is validated. Here’s the code for creating the button and adding the click handler. This code creates a button and adds a click handler. 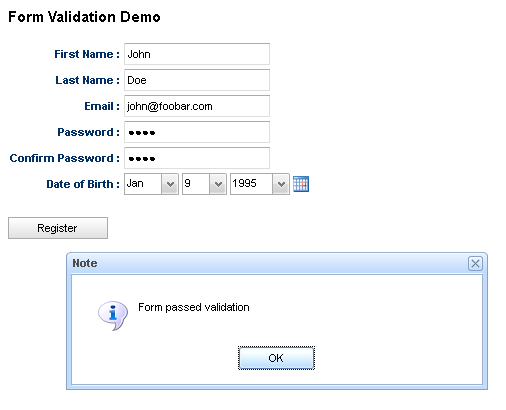 The click handler performs validation on the form by calling form.validate(). This returns true if the form passed validation. For our simple test program, we will display a message to the user if validation passed. 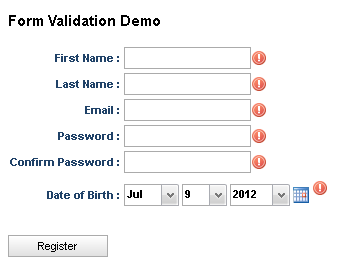 If validation failed, then the form will have error indicators. The diagram below shows a successful form validation. The diagram below shows a form that has failed validation. When you mouse over the error icons, then it displays the actual error message. If you’d like you can customize the form to also show the error messages with form.setShowErrorText(true). That’s pretty much it. 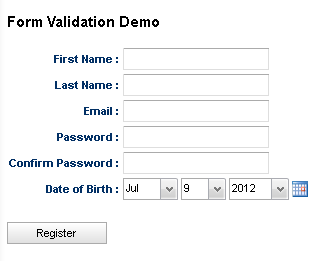 We developed a SmartGWT form and added validation rules for the various fields. The rules included required fields, regular expressions, matching fields and data range. The complete source is available for download.